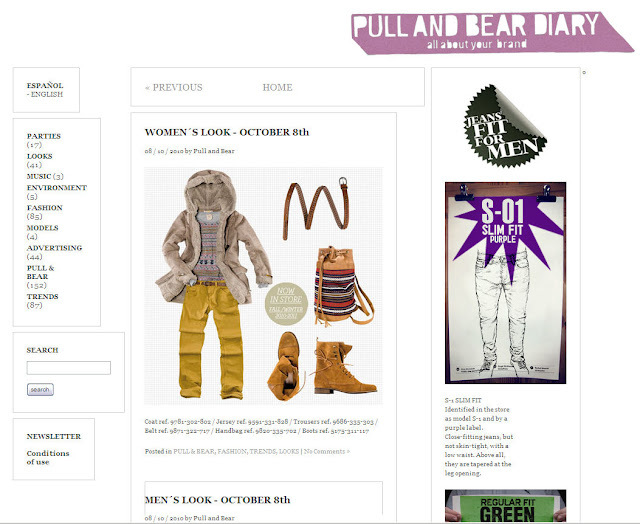 Extra Fashion: Pull and Bear - Definitely getting it right. You may not have heard of the Inditex brand, Pull and Bear. Inditex's most famous and popular brand, Zara, has found great success in the UK with their fast fashion offerings and gorgeous womens wear. Recently, Inditex decided to open another of their acclaimed stores, Pull and Bear in the centre of London on Oxford Street ( opposite House of Fraser and John Lewis in case you were wondering). It is one of four UK stores, and by the looks of things, is setting its mark on the English high street. I visit Pull and Bear every time I nip to London, and it never fails to satisfy; I always leave holding one of their cute little bags. Hopefully Inditex will open a Pull and Bear in Manchester centre very soon, but until that time, we have their fantastic web site to lust over, and it really is something to shout about. Feast your eyes on this piece of beautiful design. Navigation buttons run along the top of the page, (Collections, Events, Blogs, Follow Us, Stores, Customer Service, Company) large image links run along the bottom of the site, all in black and white until a mouse is ran over the image, and the image becomes colour. And along the centre is a banner of photography, beautifully styled, and basking in the christmas aesthetic. When one clicks on any of the images, it is automatically zoomed, in order for the user to view further close up details... the only downside, this does not allow purchase. The site is not yet transactional, but a brand building, brand awarness portal. The site instructs the user that the clothes are 'distributed exclusively' through their stores and that online sales are not available. Although the site cannot be used to purchase, they still go out of their way to show you as many products as possible with a little bit of info on their pricing. The pictures are beautiful and have obviously taken tender loving care and time to edit. You can filter between countries, gender, and then product category. For a different twist, instead of laying out all of the clothes one by one, only one image is shown, large, and after 2 seconds, fades into another new product. This may be a problem for some websites, yet as this site is non-transactional, the user is not in the same rush as the purchasing consumer. They want to wait and bask in the calming movements and beautiful products. This site almost insists that you sit, wait, discover and enjoy. If that wasnt enough, and if I wasnt already super excited for christmas, the home page of the website runs a brand video, where Pull and Bear brand ambassadors aka, beautiful people, set up a Pull and Bear store in what looks like a Canadian paradise somewhere out in the open. 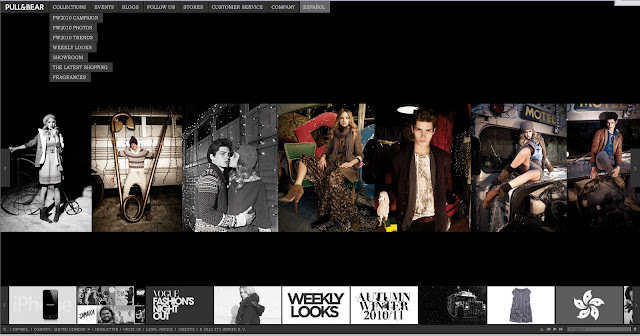 They are all dressed in the best of the best from the Pull and Bear Winter seasons collection and really make the user excited about the clothes. Its inspirational, aspirational and I want to run to the store with my credit card straight away. 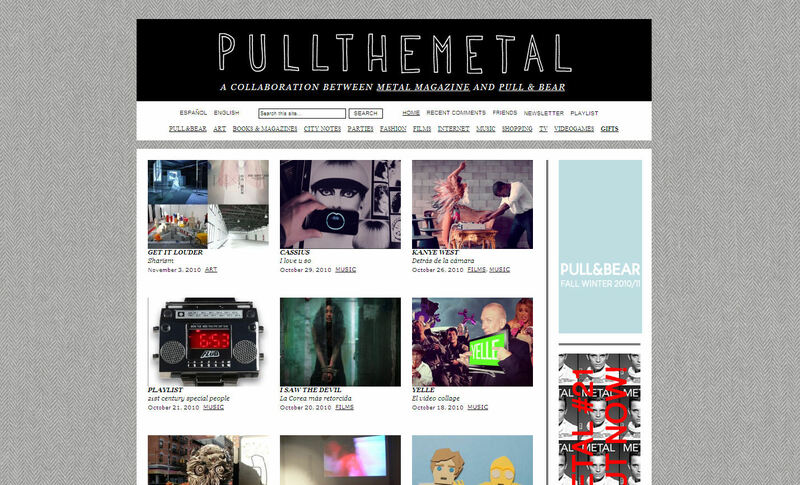 But dont take my word for it, visit the site yourself and watch the video, its really fantastic. 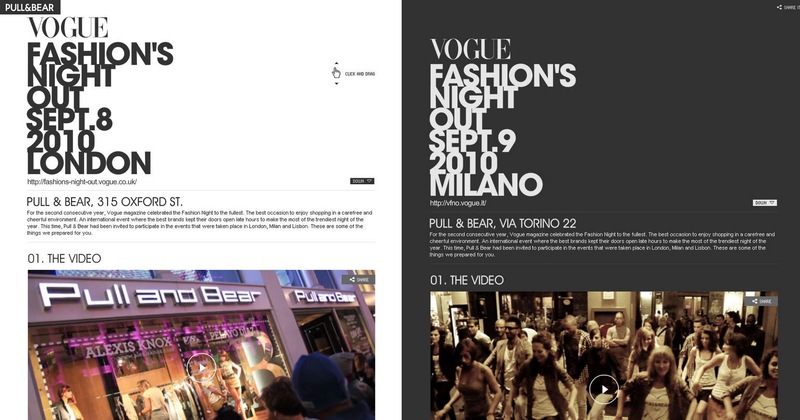 The events section of the site, listed next to collections and blogs, shows the user past events for the brand. But they are so beautifully presented, with videos, images and text, I feel like I have missed out on the event of the year. The attention to detail and consumer experience on this site is really extraordinary. I do not expect an event video, photos or extra information layed out in a blog style, but my oh my do I love how they have taken the time to show me everything about the event right down to the DJ's. This part of the website I absolutely adored. It is listed under 'collections' and the 'latest shopping.' Never have I seen so much detail placed into the product viewing. The long tabs labelled by numbers open out when clicked, and display 6 images, yet as in the example below, some of the images have been illustrated in a fun and abstract manner. When one clicks on any of the images, the image turns to colour and zooms towards the user in a slanted, awkward camera movement, that on my first viewing, made me gasp with utter delight. You need to check it out to understand what I mean. There are no boring straight angle zooms on this website. 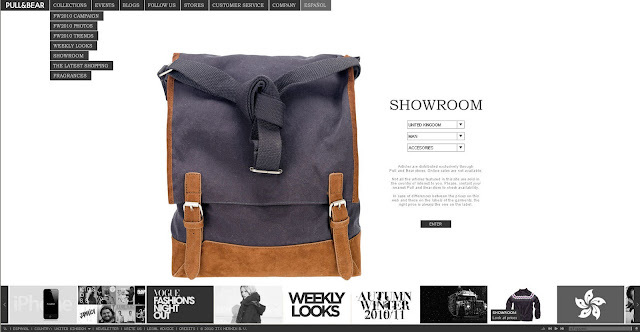 So much effort has been placed into this site, I am surprised they are not everyones favourite brand. 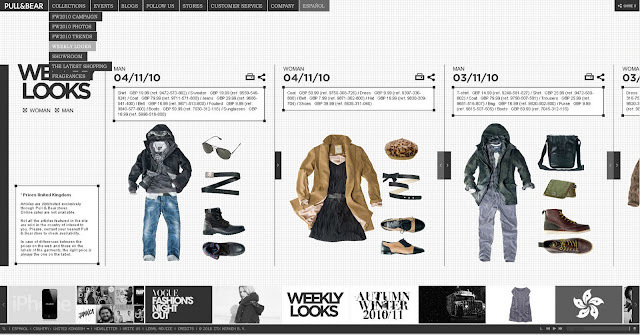 And finally, another section that I really loved: the weekly looks. Styled for the user, collections placed perfectly together, mixed between mens and womens, and with a scroll bar movement across the centre, again one cant help be inspired by the clothing. Excellent website design: check. Fantastic inspirational imagery and videos: check. Superb consumer experience: check. Pull and Bear your new favourite store? : hell yes check! !